Ebola in New York: Will U.S. Stocks Follow Europe Lower? 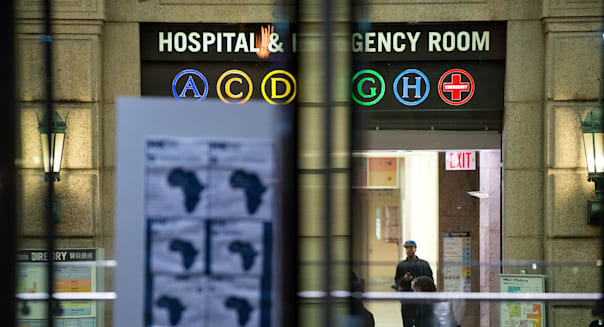 Bryan Thomas/Getty ImagesA health alert is displayed Thursday at the entrance to Bellevue Hospital in New York City. The diagnosis of an Ebola case in New York sent U.S. futures into a tizzy, spurring worries Wall Street may give up recent gains, as Europe stocks fell Friday. The pan-European FTSEurofirst 300 was around 0.4 percent lower in early trade, following the reports of the first Ebola case in the U.S.'s financial hub. "Even though you hear what health workers or the government is saying, that you don't catch Ebola as easily, it's just the fear that would probably drag markets down," said Song Seng Wun, head of research at CIMB in Singapore. "Anxiety is not good for economic activity, especially coming up to the festive holiday [season]." U.S. futures indicated a slightly lower open Friday. But Asian stock markets remained sanguine Friday, and Song said he expects them to keep their cool: "We've been through SARS and bird flu from Hong Kong ... We're a bit more level-headed." A doctor in New York City, identified as Craig Spencer, has tested positive for the Ebola virus after returning from treating patients in West Africa. He had contact with four other people, rode the city subways, went for a three mile jog and even visited a Brooklyn bowling alley within the past week, city officials revealed Thursday, although they also issued reminders that Ebola isn't an airborne disease and transmission requires contact with bodily fluids. In the wake of the news, Dow Jones industrial average (^DJI) futures dropped more than 70 points and the Japanese yen, generally considered a safe-haven play, strengthened by around 0.3 percent against the greenback, but most Asian shares didn't react much. But Song cautioned that the "picture could well change here in Asia" if U.S. futures continued to fall. "It's the weekend. You don't want to appear too heroic," he added. Some noted that they don't expect much of a fundamental market impact from Ebola. "It's really a sentiment issue," said Hans Goetti, head of investment for Asia at Banque Internationale a Luxembourg. "Part of the reason for the short sell-off last week was possibly Ebola, but it's impossible to quantify the impact on the economy at this stage." He expects some near-term volatility in markets, but noted that clients aren't expressing any concerns at this stage. "It weighs on sentiment, but I really fail to see the real threat," Goetti said. "If Nigeria can get Ebola under control, the U.S. should be able to and Europe as well." On October 20, the U.N.'s World Health Organization declared Nigeria free of the virus after 42 days passed without a new infection. Others are looking to any potential declines as a chance to profit. "If the stock market were to take a little bit of a step back because of the news we got out of New York today, that would certainly be unfortunate, but the goal here is to buy good stocks at great prices," Scott Nations, chief investment officer at NationsShares, told CNBC. To be sure, some stocks are getting a boost from the latest Ebola scare. In intraday trading in Japan, Fujifilm jumped 4 percent on hopes that its influenza drug will cure the virus. Makers of air purifiers and protective clothing, such as Azearth and Teikoku Sen-I, rallied 17 percent each intraday.